One of the most important of the generation of composers following Josquin and preceding Palestrina. Though trained in Paris, Willært sought his musical fortunes in Italy where the thriving system of patronage in the Italian courts and chapels still favored northern-trained musicians. After serving in the Ferrarese court for over a decade, he became chapel master in 1527 at St. Mark's basilica in Venice, a position he held for the rest of his life. Under his direction, this musical institution was transformed from a provincial establishment into one of the most lavish in all of Europe. Adept in all the musical genres of the period, Willært made significant contributions to the development of the Italian madrigal and the French chanson, published the first examples of polychoral psalm settings and even fostered the emerging genres of instrumental ensemble music with several published collections. 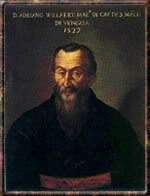 As a teacher, he helped to shape a whole generation of musicians that came to be known as the Venetian school and numbered among his pupils Cipriano de Rore, Andrea Gabrieli, the theorists Gioseffo Zarlino and Nicola Vicentino, and the organist-composers Claudio Merulo and Girolamo Cavazzoni.